April 26, 1875 - Charles D. Jones was born at Zanesville, Ohio. He was a member of the first Alaska Territorial Senate, was appointed U.S. 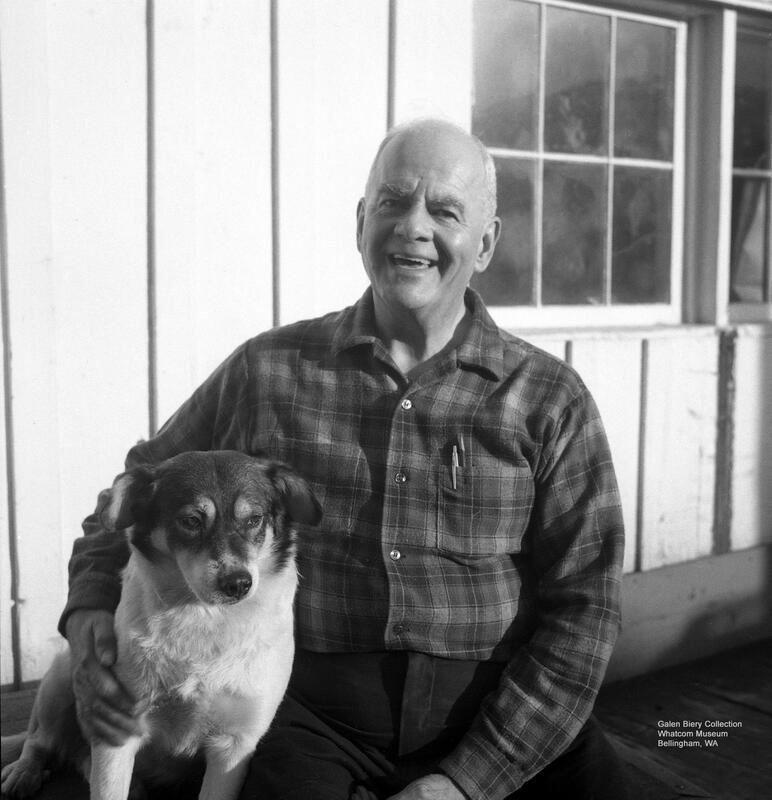 Marshal at Nome and returned to the Senate for a term in the 1950s. 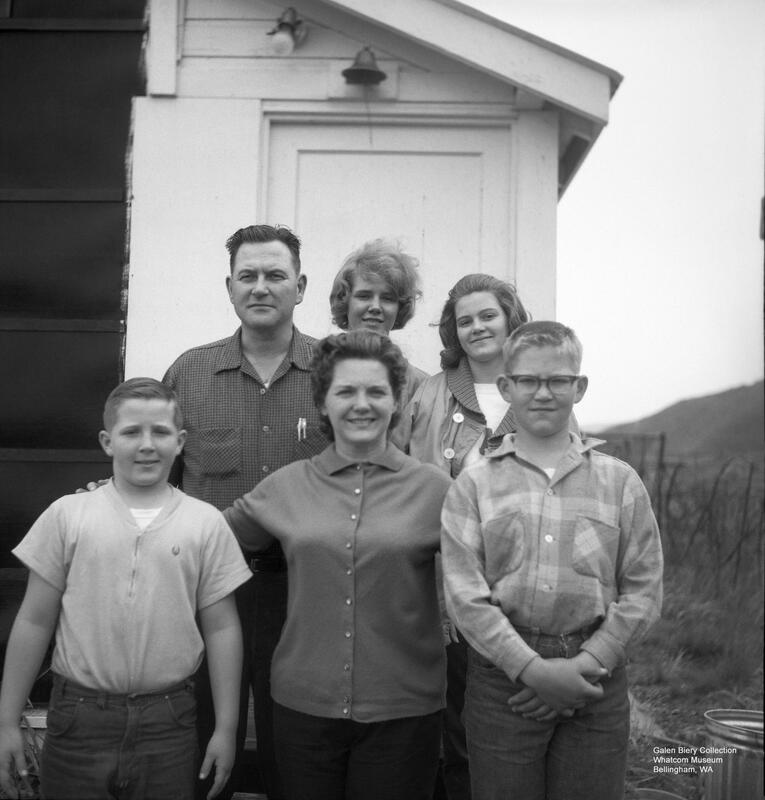 In the spring of 1962 when I was 11, my father, Elden Metzger, announced to the family that he would be going fishing with his brother, Wayland, for the salmon season at a place called Alitak. Wayland had been a machinist with Alaska Packers Association and through that association and with his friend Don Slater they had acquired some set net sites in Alitak Bay on Kodiak Island. My father was a small contractor who moved houses and did foundation work. Bills were many and incoming payments were slow. He was offered $1000.00 for a season’s work. I remember quiet discussions at home, visits to my uncles where they talked loud about the preparations for fishing and stories of great bears roaming the beaches. Mostly I remember my mother’s tears when we all said good bye to my father at the SEATAC airport and watched as he boarded the PNA Constellation for the 7 hour direct flight to Kodiak. School was out and my mom, older sister Kathy, younger brother Russ and I headed to the berry fields for a summer of berry fights and sneak swimming in the irrigation ponds. It seemed like forever but a letter finally came to us from Alitak. Dad said he missed us all and hoped we were all doing our share to help Mom out with chores and things. My sister was. Her berry card scored over $100. My brother and I were not so good. He told of great whales beaching, giant crabs, beach combing, bears, beach seining, picking fish and meeting a man called T.T. To this day I am not sure how it all transpired, but somehow my father and T.T. 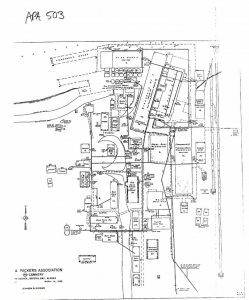 Fuller made an agreement for the sale of Fuller`s mom and pop cannery operation and set net sites in Kempff Bay next to the Pacific American Fisheries cannery in Lazy Bay. 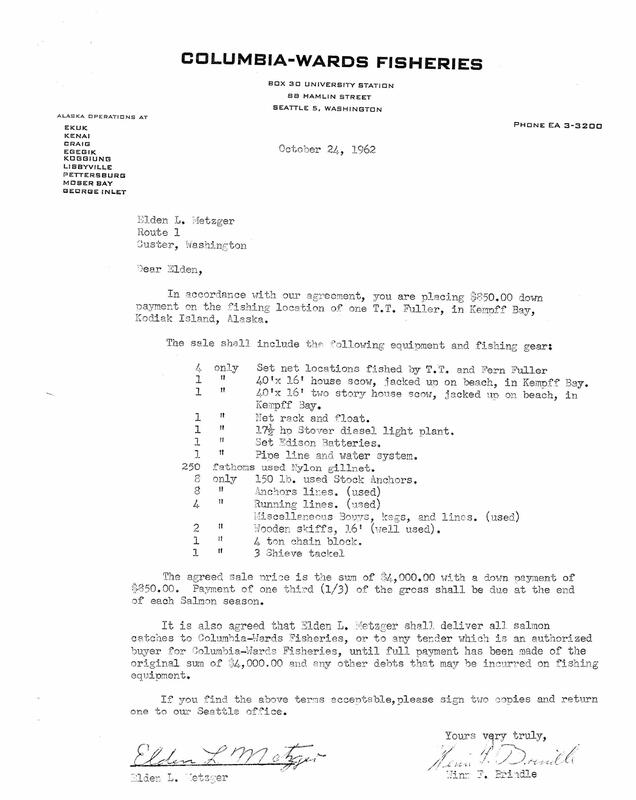 My father used $850.00 of his $1000 season’s pay as down payment and somehow (considering he had been fishing for APA) secured financing for the balance through, Winn Brindle the young superintendant of the Moser Bay Columbia Ward Fisheries (CWF) cannery, who had a joint packing agreement with PAF and the Alitak cannery. My father made it home with $150 of his summer’s earnings and tales of excitement and adventure that would keep a 12 year old awake at night knowing that the next summer would not be spent in a berry patch. In the spring of 1963 we kids were let out of school early to leave for Alitak. There was no sadness in the family for this departure, but my mother wrote in her journal of her reservations of the trip and our new life. 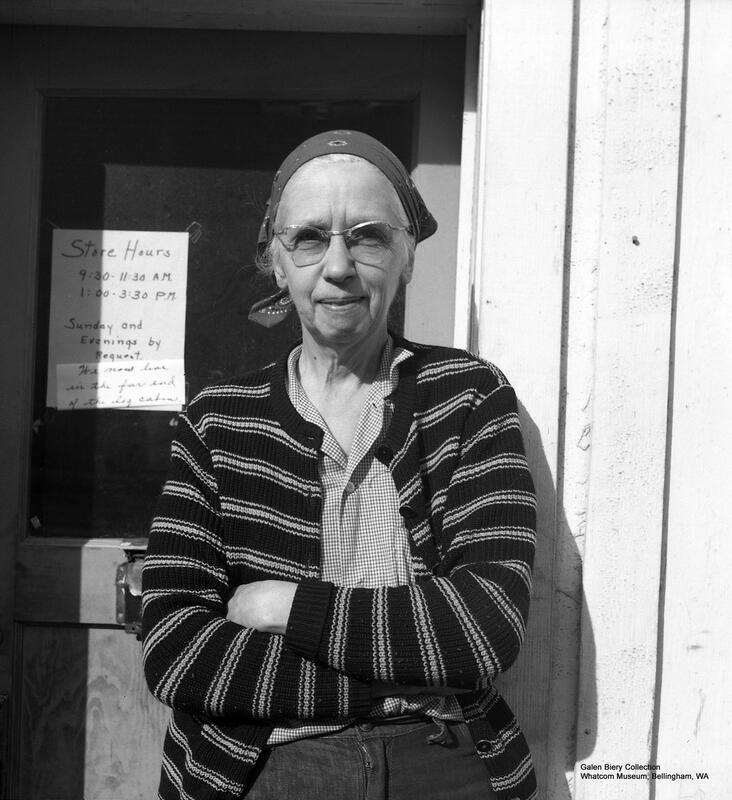 Fern Fuller in front of PAF Alitak store, 1962. T.T. 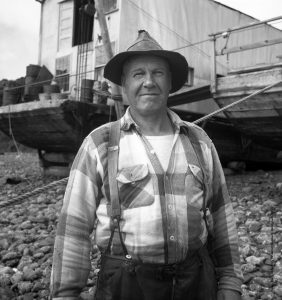 (Ted) Fuller at his crab cannery in Kempff Bay, 1962. 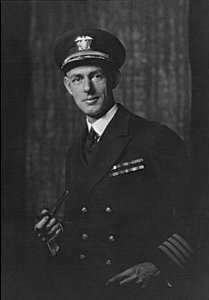 In addition to operating their own small crab cannery and set net sites, the Fullers worked as winter watchman for the PAF Alitak Cannery. We arrived at Kodiak on a cold, gray day. The most memorable part of my first flight to Kodiak on the PNA ” Connie” was watching the oil streak down the engine cowl and drip off into space, and my father and friend wondering if it held enough oil to make it to Kodiak. It did. 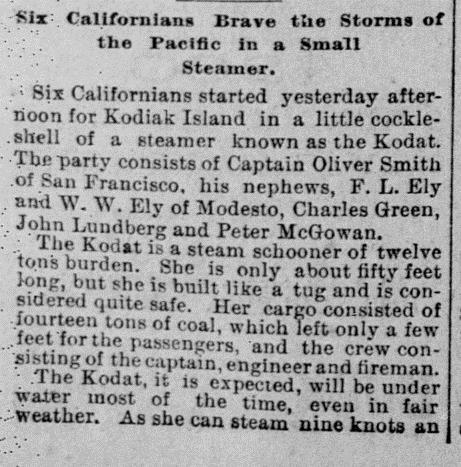 We were met at Kodiak by T.T. Fuller and taken to his 2-story water front apartment building where we were fed a spaghetti dinner by his wife, Fern, and then down to Kodiak Airways where there was a Grumman Goose waiting to fly us to Kempff Bay. It was a long night and day, but we arrived full of excitement and energy for adventure. Little did I know that this day would be the first day of a 54 season career of fishing and working for the Alitak cannery and that I would someday be a part of over half of the history of the Alitak Cannery. The summer of 1963 was one of fun and adventure for us boys. Dad was fishing for the C.W.F. Moser Bay cannery under joint agreement with P.A.F., and a highlight of the summer was riding on the tender Ermine from Kempff Bay to Moser Bay, when we got to take turns steering. Our parents were going to meet us there after visiting with some other set netters on the way. Their visit lasted longer than it took us to get there. We were left alone aboard the Ermine to wait for our parents while the crew went about their business. In our boredom we decided to climb the mast which led to my first encounter with Winn F. Brindle. He spotted us from his office window and with a loud bellow stomped down the dock asked whose kids we were and told us to get off the boat and sit on the dock’s bull rail until our parents arrived. We did as he said and for the rest of the summer tried to stay out of his sight. My first visit to the Alitak cannery was less eventful but little did I know that Brindle would soon be the master of that location, also. It was here we met Rod, the jovial storekeeper who always had some smashed candy he said he couldn’t sell, and a bellowing giant of a beach boss, Eric Johanson, whose look would cower a 12 year old lad but who in truth was a gentle soul and a very kind man. 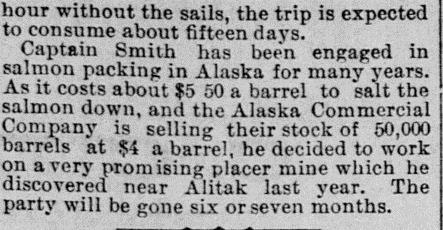 It was here at Alitak that I was introduced to the long, long tradition of mug up at the Alitak cannery. At 10 am, 3 pm and again at 8 pm long tables were set with coffee, hot chocolate, cookies, pastries and cold cuts for the cannery crew and after their break the tables were left full for the fishermen. It was here that a shy 12 year old could sit in a corner munching a cookie with hot chocolate and overhear stories of who was who and how it was back when. I listened to the stories. I remembered some, verified some and forgot some. My heroes were the highliners of the day and my dreams were to be as they. As the years and seasons progressed the old timers faded away and I found myself being the one telling the stories at mug up and being asked how it was back then and who was who at Alitak. About this time Woody Kneble showed up at Alitak and started poking around into the history of the place and asking questions about when, where and who, we quickly realized that there were not too many people left that could carry on the stories of Alitak. We started taking notes and gathering tidbits of information and gathered related artifacts for a small display at the cannery. One thing led to another and we decided it needed to be written down. We received a grant from the Alaska Historical Society to help with the research and acquisition of information. We have now twice missed the deadlines for submission of our work and the patience of the Society and our expectant readers is wearing thin. 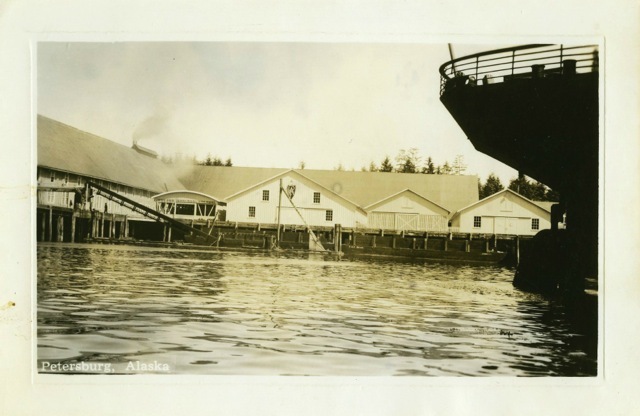 The physical history of the Alitak cannery is easy to document from archives, news clippings, memories and old photos that can be scanned and easily assembled and published. Our work has led us into an amazing abyss of people, events and crossed paths that helped set the stage for the Alitak cannery. It has been our endeavor to try and work in enough of the peripheral history to excite interest and imagination without taking away from the cannery story itself. Wayne Axelson was the PAF Alitak superintendant in 1963, with his family. From the earliest know inhabitants of Alitak, to the Russian fur traders, the sealers and otter poachers, the whalers, the gold seekers, military operation, the accomplishments of the men whose namesakes mark the prominate geography, shipwrecks, competition between the canneries and fisherman, inventors, eccentrics and many more, all had a hand in the history of the Alitak cannery . Sorting through all of the information and deciding what to use has become an enormous task for an illiterate like me. Kindly bear with us as we continue the work to finish this project. This article has been automatically clipped from the San Francisco Call, organised into a single column, then optimised for display on your computer screen. As a result, it may not look exactly as it did on the original page. The article can be seen in its original form in the page view. If anyone has any pictures or stories of events or characters from the Alitak area, please contact Rick Metzger at alitakrat@aol.com. Note: The following was written in the Fall of 1976. No salmon canneries remain on Ship Creek today. 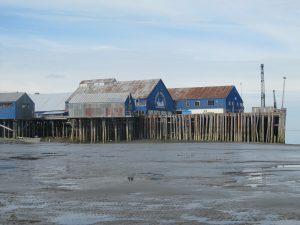 Below the hustle-bustle of downtown Anchorage, at the mouth of Ship Creek, is the only remaining salmon cannery in upper Cook Inlet. 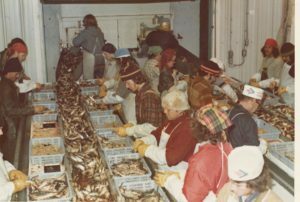 At one time there were two canneries in Anchorage and three in the upper Inlet area, but the days of small, owner operated canneries in Alaska are over and only the Whitney-Fidalgo Seafoods, Inc. Anchorage cannery remains in upper Cook Inlet. This cannery is a direct link to a large part of Alaska’s past – the salmon canning days. Starting in Southeast Alaska in 1878 and growing to a peak in 1936 with a pack of 8.4 million cases, the salmon canning industry has had a powerful impact on the economic and sociological development of Alaska as a territory and as a state. Today the industry still plays an important role in the Alaskan economy, providing summertime employment for people from remote area and market for fisherman to earn the money they need to sustain them throughout the remainder of the year. Many of these peoples live in the bush year-round or are Natives in remote villages and settlements who fish for subsistence. It was a mix of people such as these that I met and worked with during three summers of employment at the Anchorage cannery; 1974, 1975, and 1976. Mostly set-net fisherman, they fished the upper Cook Inlet shorelines, intertidal areas and Susitna River delta. Fishing in 25 to 30 foot tidal fluctuations and murky brown water they tended their nets with outboard powered skiffs, delivering their catch to the cannery or to the shallow draft scows and tenders that operate in the inshore areas of upper Cook Inlet. The catch from these fisherman is canned at the Anchorage cannery. First built in 1931, and operated by H.J. Emard as Emard Packing Company, Inc., it survived a period of which I know little of its history. Johnny Bumanglag, the fish house foreman, and Joe, the present-day retort operator, are still working from the 1930’s when Emard first starting canning salmon there. In those days the F/V Henry J. served as a tender to upper Cook Inlet fishermen, taking out the scows in the spring, picking up in the summer and returning them to the cannery in the fall. Ship Creek, the waterfrontage of the cannery, is not too aptly named since few ships (or boats) can operate in a channel that fluctuates from 1 to 31 feet in 12 hours or less. Only flat bottom vessels or vessels with hulls strong enough to withstand several beachings during the course of a visit can “tie up” to the cannery dock. Large flat-bottomed vessels are often brought into the mouth of the creek and unloaded next to a concrete ship that is permanently dug into the Terminal Yards fill at the mouth of Ship Creek. 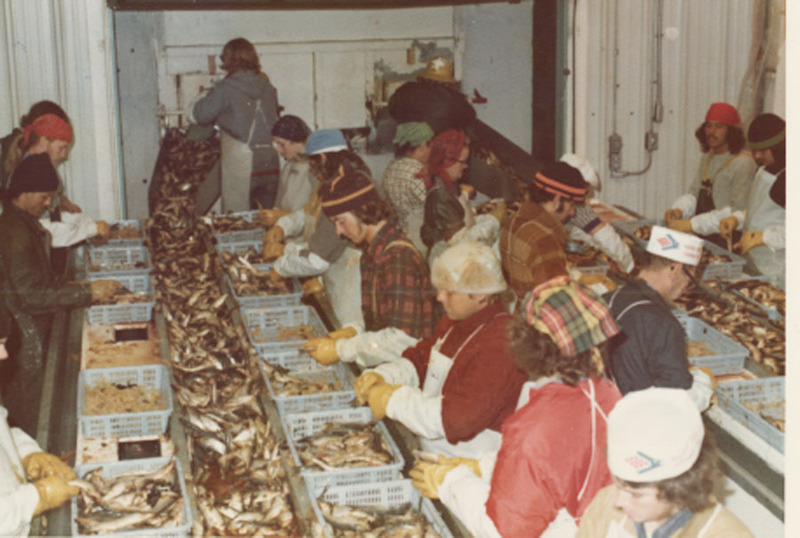 Processing herring at the Ship Creek facility in 1972. Photo courtesy Dexter Lorance. 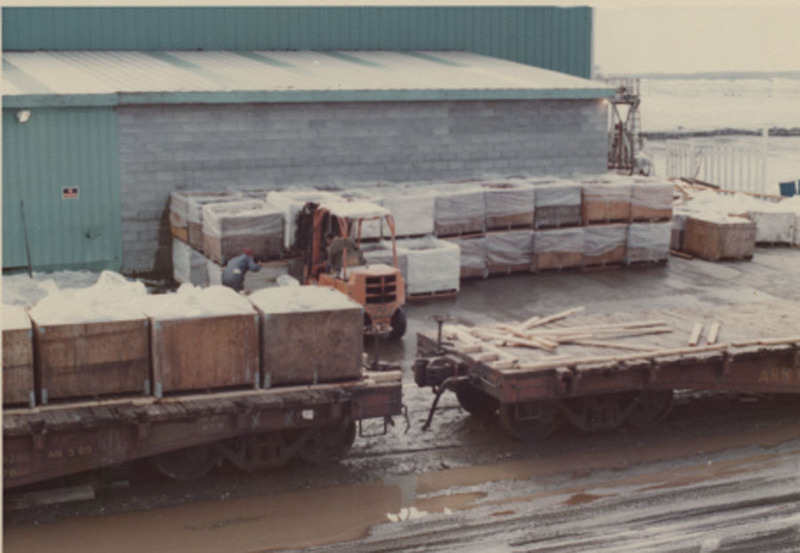 Fish arrives via rail to the Whitney-Fidalgo cannery in Anchorage in 1972. Photo courtesy Dexter Lorance. The cannery is a collection of rather jostled and dilapidated old buildings and trailers that show their age and the fact they suffered through the Alaska earthquake of 1964. Inside the canning line warehouse, the can shop normally on the second floor of canneries, rests at the same level as the canning line, a result of the floor collapsing beneath it during the earthquake and cannery economics dictating it to be left there as long as it worked. No wonder one can walk along a wall in the warehouse and come upon a window in the wall whose top edge is below the waistline. A small group of people live on the premises, similar to remote area canneries that are complete settlements in themselves, but the majority of workers commute from within the city. 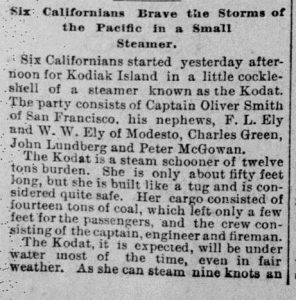 The machinist crew, Filipinos and office workers are brought in from the lower 48, and rest of the crew is hired from the local work force. Some of them have been working canneries for many years, such as Minnie who lives in Wasilla and commutes to work, often staying and sleeping in her car when working into the wee hours of the night. Squeezed between Elmendorf AFB, Terminal Yards and downtown Anchorage you can almost hear the cannery breathe a sigh of relief to be connected on a waterway to the open ocean waters. The city is moving in all around. Much of the property the cannery is located upon is on old fill from early day excavation projects in surrounding areas. Jutting into this fill and coming right up to the cannery road, is little estuarine bay of vital importance to the cannery. Along the edges of this small embayment are skids upon which the fish scows are placed in the wintertime to protect them from the freeze up of upper Cook Inlet waters. The scows are placed out in the spring at strategic locations on the east side of Cook Inlet from Boulder Point to Fire Island and on the west side from Tyrone to West Foreland. The fisherman, notified of openings by radio and written notice, net and recover the salmon and deliver their catch to the scows. There they are covered with wetted burlap to keep them cool and protected from the wind, sun and seagulls. 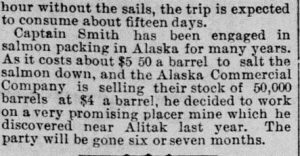 The fisherman return to their camps and a tender from the Anchorage cannery comes on a regular schedule to pick up the fish. All five species of Pacific salmon ae caught in upper Cook Inlet with reds and pinks making up the majority of the catch. Counts are kept of the number of each species from each bin and a fish ticket is written up for the fisherman registered to that bin. Back in the cannery office the fisherman will be credited with an amount equal to the number of each species landed, times the average weight of that species that week as determined by a negotiating board or an Alaska Department of Fish and Game sampling crew. 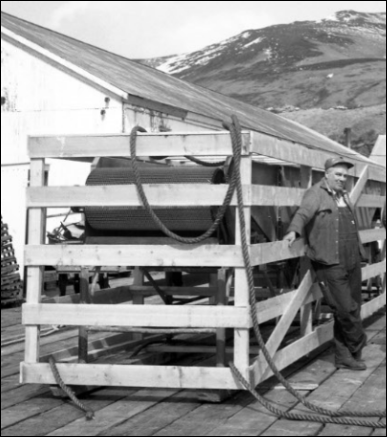 The scows are the only logical low cost way to service the fish camps along each side of upper Cook Inlet. Requiring little maintenance, each scow can accommodate the fish from several individual fish camps along that stretch of the shoreline and minimize the time the tender needs to pick up the fish. These fisherman have banded together into the Upper Cook Inlet Fisherman’s Association and it is this group that Whitney-Fidalgo officials must bargain with each year for the prices and contracts to fish. Other processors compete for the fish in the area, with Kenai being the most popular alternative landing site. During the peak of the run it is not uncommon for the F/V Totem (the modern day replacement of the Henry J) to return to the cannery loaded to the brim with pink, red and silver salmon. Often times having 20,000 or more fish in its holds, the Totem will bring in two such loads a week. This is when the people in the canneries earn their salt. With no holding facilities for this mass of fresh product, except for a few chilled seawater bins that act as temporary storage silos, these fish must be canned. The machinery has got to operate correctly and the people must work until the job is done. If the cannery superintendent could find robots to man the machines at time like these he would be satisfied. Instead they often bend to the fact that real human people work at the cannery and they often knock off work just after midnight to allow the cannery crew some sleep (often averaging less than 6 hours) before starting up the cannery again the next morning to can more fish. The times of working past midnight do not usually last more than 8-10 days at a stretch and thank heaven! You can only like salmon, working and making money just so much. Then there is your body to consider. The cannery becomes a world unto itself. Those of us that lived there would seldom wander even up into downtown Anchorage – less than one mile away. The entire plant and its operations became dependent upon the outside connection of the ALASKA railroad, delivering the tin ends and can bodies and taking away the still cooking pallets of canned salmon. The warehouse of the cannery is so small and lacking in floor space that if the pack was not removed daily by rail cars and new ones spotted at the doors, the pallets would be stacked on the floor and this accumulation could shut down the cannery operations within 24 hours. The effluent from the cannery operations is discharged into Ship Creek. Thousands of pounds of offal – everything on the fish that is not canned or salted – is ground up and mixed with water to form a slurry. This slurry is piped to below the mean low water mark on Ship Creek to meet the Environmental Protection Agency’s effluent permit and released. There the ever-hungry, opportunistic seagulls find it. In the summer, on low tides one can always tell at a glance whether or not the cannery is operating by the presence or absence of large numbers of seagulls alighting on Ship Creek just below the cannery, floating downstream bobbing and ducking for the salmon offal and screaming, screeching and fighting amongst themselves. The gulls, mostly California gulls, roost upon the mud flats below downtown Anchorage and feed upon the cannery effluent. Streams of gulls capitalize upon this food, forming a steady circle from the mouth of the creek up to the discharge pipe. It is quite a spectacular sight – I have seen feeding congregations of 5,000 or more seagulls below the cannery. Some of the gulls are huge and will attack unsuspecting humans! I have two documented cases of seagulls attacking people in the Terminal Yards area. My guess is more people have had the experience, but are afraid to reveal it for the sake of ridicule. Who has ever heard of such a thing – dive bombing seagulls, noiselessly heading for your head? Often times they drop a little package as you dissuade them to leave. Alaska is full of animals that will attack, but seagulls – without provocation? As sudden as they start, the salmon runs in upper Cook Inlet start to diminish. The Alaska Department of Fish and Game begins to limit fishing time, catch per unit of effort decreases and the fisherman cease fishing. It is more profitable, or less expensive for them to resume other activities. They close up the fish camp, move back to the city or the bush and wait until next season. Life at the cannery continues with the necessary clean up, machinery maintenance, final shipments of canned salmon and recovery and storage of the scows for the winter. The last week of August is traditionally the time when the scows are towed back to the cannery dock by the tender, moved at high tide by the beach gang in a small runabout to the foot of the skids, and winched up by the old authentic looking steam engine. There they are secured and left for the winter. The tender leaves and goes south for the winter before the freeze up as does the cannery crew. The buildings are boarded up to await the next spring and beginning of another salmon canning season. The shores of Mitkof Island were pretty quiet for millennia. Mitkof Island was a great little spot for summer visitors, people interested in catching life sustaining fish, but the island never caught on as a place to set down roots. In 1898 that changed. Petersburg, Alaska is a small town on the northern tip of Mitkof Island. All indications lead us to believe that the town of Petersburg was the first permanent settlement ever constructed on the island. There are many fish trap sites filled with artifacts and middens, some dating back 2000 years or more, but there is no evidence of a permanent village site. You might ask why anyone would settle a place that had been discarded as a habitable location for centuries. The answer is fish. People have utilized the fishing resource Mitkof Island provides for millennia. Nobody is quite sure why it was never settled by the Native people in the region, but theories abound. Some think it is because of the weather patterns, others think it may have been a buffer zone between Native groups. For whatever reason, the island that was least inhabitable to Southeast Alaska Native people, seemed to be the ideal location for Norwegian fishermen and their families. 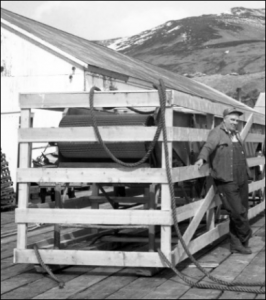 Peter Buschmann, a Norwegian entrepreneur from Aure, Norway was in the business of setting up fish canneries and salteries along the shores of Alaska’s inside passage. Petersburg is located between Sumner Straight to the south and Fredrick Sound to the north with the Wrangell Narrows sliding along it’s western shore. Peter Buschmann would have sailed by the island many times while managing his operations to the north and south. He would have had to notice the large icebergs from LeConte Glacier floating in Fredrick Sound and thought it would be a good idea to expand his holdings with a cannery site on Mitkof Island. In 1899 the Icy Straight Packing Company was built on the northern shore of Mitkof Island with money from people who had invested in his other operations. Peter Buschmann needed a workforce so he sent word to Norway and friends and relatives showed up to work. He also brought Chinese people to Petersburg to work in the cannery. Later, Native people from Kake joined the workforce. Salmon was plentiful in the area, as was halibut. The ice from LeConte Glacier kept the halibut cold all the way to Seattle. Salmon was canned and salted and sent south too. Norwegian settlers continued to make their home in Petersburg, which became an incorporated city in 1910, two years after the initial articles of incorporation were rejected because women had signed them. By 1910, the Icy Straits Cannery had been purchased by the Pacific Packing and Navigation Company in 1901 and the Pacific Coast and Norway Packing Company in 1906. In 1918, after going through bankruptcy proceedings, the Norway Packing Company reorganized as the Petersburg Packing Company, with Oscar Nicholson as superintendent. He operated the cannery until 1933 when it was sold to Pacific American Fisheries. In 1965, Bob Thorstenson organized a group of Petersburg residents and fishermen to purchase the cannery from PAF. The Petersburg stockholders named their cannery Petersburg Fisheries Incorporated, PFI. The company expanded and became Icicle Seafoods, one of the largest fish packing plants in Alaska. In 2010 Petersburg stockholders sold their Icicle shares to Paine and Partners, an equity firm and in 2016, the plant was purchased by Cooke Aquaculture, a Canadian fish company. The Clausen Memorial Museum has many images of canneries taken from 1998 through the present day. We have spent the last year locating these images, entering them into our Past Perfect data base and storing them appropriately. The Icy Straits Cannery, which is now Icicle Seafoods, has been the lifeblood of our town and the images bring Petersburg’s history to life. We also have images of the many other canneries that have and continue to operate on Mitkof Island. 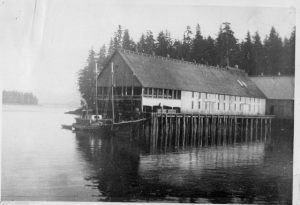 Individuals and organizations are now able to obtain historical cannery images from our museum. 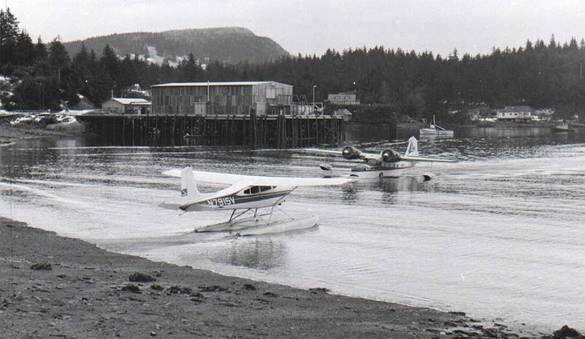 Glacier Bay Seafoods in Ouzinkie, Alaska, in the early 1970s, with a Kodiak Air Grumman Goose mail plane heading to the village beach. Photo by Tim Smith. We were never supposed to live in Ouzinkie. That revelation from my mom blew my mind. We had never been one of those families that had meetings to discuss things, but I always assumed at least my mom knew what was happening. As it turns out, not so much. I’d wondered why we left our two wonderful dogs, Missy and Gazebo, at our home in Anchorage under the care of neighbors when we moved to Ouzinkie in 1972. Turns out, Mom thought we were just going for a visit, maybe a few weeks, maybe a month. Just to see my dad, who was over there — wherever “there” was — getting a shrimp processing plant running. 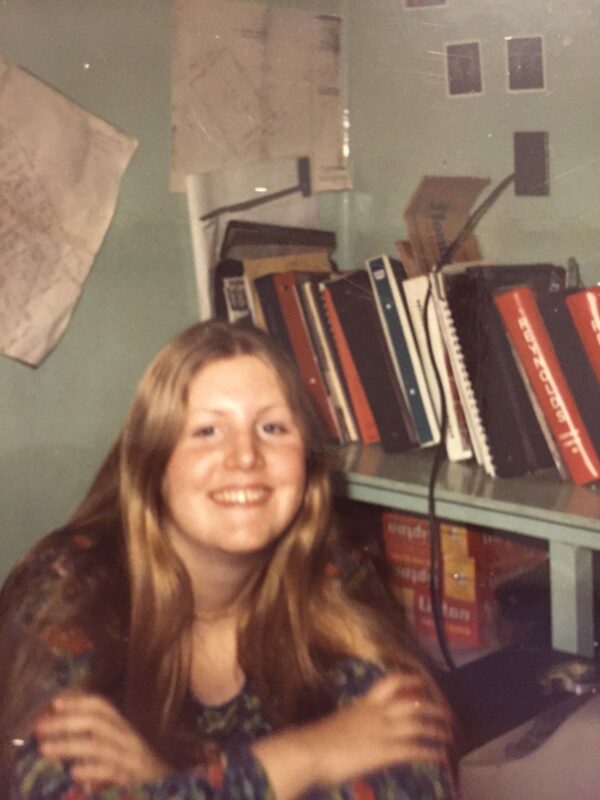 Susan Morgan in the cannery office, 1973. It took me 40-some years to learn that the same things that surprised me about Ouzinkie also surprised her. For example, like me, Mom wasn’t thrilled that my brother and I had to sleep in the cannery’s brightly lit office at the far end of the dock over the water that first summer. There simply was nowhere else. And she definitely wasn’t happy to learn that the tiny pink trailer at the other end of the dock where she was supposed to stay with my dad was also occupied by the cannery’s then-foreman. But probably the biggest shock for Mom was that once we were there for our “visit,” my dad gave no indication he wanted us to go home to Anchorage. Unbeknownst to her, at least at first, “home” was now here, where my dad was, in this village of fewer than 200 people. When Mom finally figured that out, she made a fast trip to Anchorage to gather more clothes and give away our long-suffering dogs. Over time, those three years in Ouzinkie proved to be life-changing for every one of us. My mom and dad built a business that, for a while at least, thrived beyond anything they’d imagined. Mom says a “ton of money” went through that plant, as endless boatloads of raw shrimp were caught, processed and sold to our eager market in Great Britain. 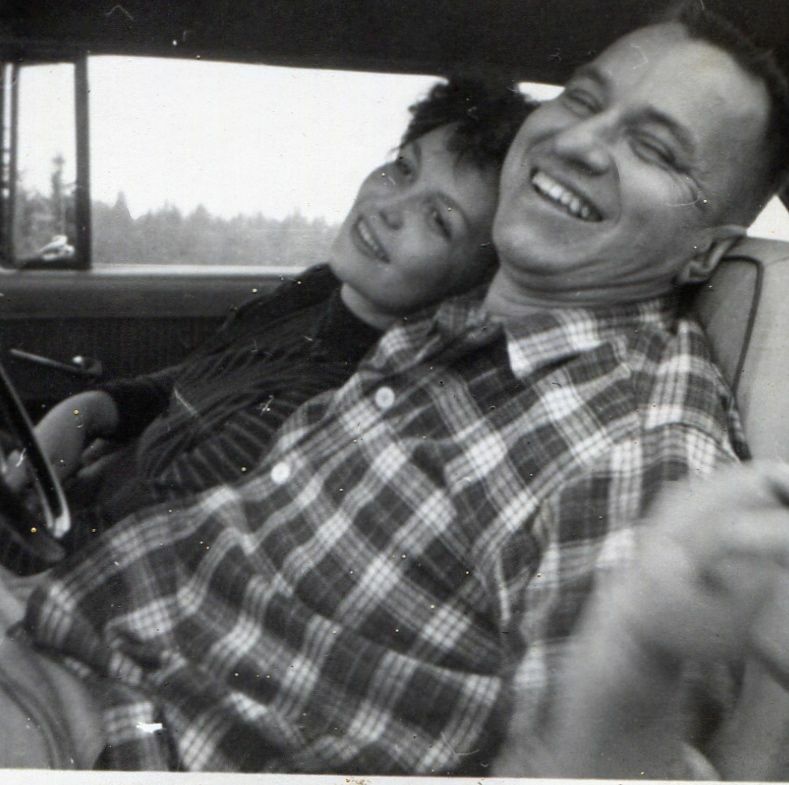 My mom and stepdad, Donna and George Grant, pre-cannery. Unlike their prior seafood ventures, my parents even walked away with a small profit at the end. When their partner bought out their share after they were too exhausted to keep the plant open any longer, they enjoyed a rare taste of financial comfort. Daddy told Mom to design her dream kitchen and they’d build it. She still loves those walnut cabinets. Those years influenced my younger brother, too, now a renowned professor and scientist who specializes in water quality. He credits time spent in the tidepools and beaches of Ouzinkie, where everything including our cannery waste was dumped in the ocean, for sparking that interest. And I’ve always referred back to that time for pretty much everything that makes me who I am. I’d grown up a quiet, middle child, and to be plunked into the middle of the wild and crazy world that was Kodiak and environs in the 1970s… well, it was a revelation. My new friends in the cannery taught me about Kerouac, the joys of communal living, pot, hitchhiking and freedom. I fell in love for the first time and experienced the deaths of people I cared about for the first time. I saw people who watched out for others in ways that went far beyond words. If someone was missing in a storm, they went — without hesitation — into the storm themselves to rescue them. Nothing was trite here, it seemed to me. Nothing was unimportant. I loved that. It felt like all the artifice of the world had been stripped away. This was how life was meant to be, I thought: elemental and true. With a hell of a lot of fun thrown in. My plan for exploring these few years when my family’s cannery operated in Ouzinkie was to discover why I loved it so much, why I remembered it so fondly 40-plus years later. I wanted to find my old friends and coworkers and learn if that place, that time, affected them as much as it did me. I did, and it did. But the biggest surprise for me in this whole enterprise was how much I learned and realized about my parents. I was a teenager when we lived in Ouzinkie, and like most teenagers, I found my parents occasionally embarrassing. 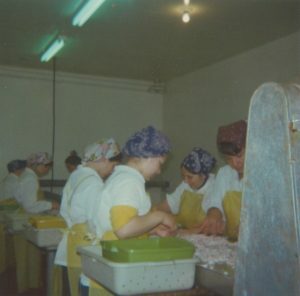 I especially hated it when they’d sometimes stroll through the processing plant, arm in arm, while my friends and I worked on the fish pick line. It seemed so … parental! But in looking back, I can see now how those strolls must have felt to them. This building where dozens of us worked, sometimes in shifts around the clock, had been empty when they bought it. They had taken nothing, a cavernous structure, and by their wits and creativity and with very little financial backing, had created this bustling plant. Villagers, college students, boat crews and more made a good living because of my parents’ creation. The fish pick line, Glacier Bay Seafoods, 1972. And the shrimp was fantastic. I don’t eat it anymore — being drenched in the stuff for three years will do that to a person — but even I know it was extraordinary. Forty years later, people I talked to remembered how great it tasted, cooked just right in pristine sea water, peeled perfectly by intricate adjustments to the giant array of peelers, and how it was then cunningly frozen in mid-air so every shrimp stayed fresh and separate. It was a thing of which they were rightly proud. I wish I’d realized that at the time. My mom believed things were coming to a crisis point for us when we left Ouzinkie. While most people there had been wonderful and welcoming when we arrived, one or two had been actively hostile. Mom suspects it was because the cannery building had previously been owned by the village, but had, we were told, been lost to bankruptcy. She and my dad, possibly seen as interlopers by some, had even been personally threatened; someone would get drunk, wave a weapon around, and vow to come down to the dock and “wipe them” — us — out. Plus, getting anywhere off the island involved flying in often iffy weather, and never mind the hazards faced daily by our boats, navigating the most treacherous waters in the world to feed our insatiable need for more shrimp. Living with worries like that can take a toll. It did on my folks. Mom’s fears seemed borne out when Dan Abell, my dad’s right-hand man at the cannery and our longtime friend, was shot and killed in his bed a few months after we left the village. And a few months after that, the cannery itself burned, destroying the place we’d lived for three years. I’ve never been able to go back to Ouzinkie since then. 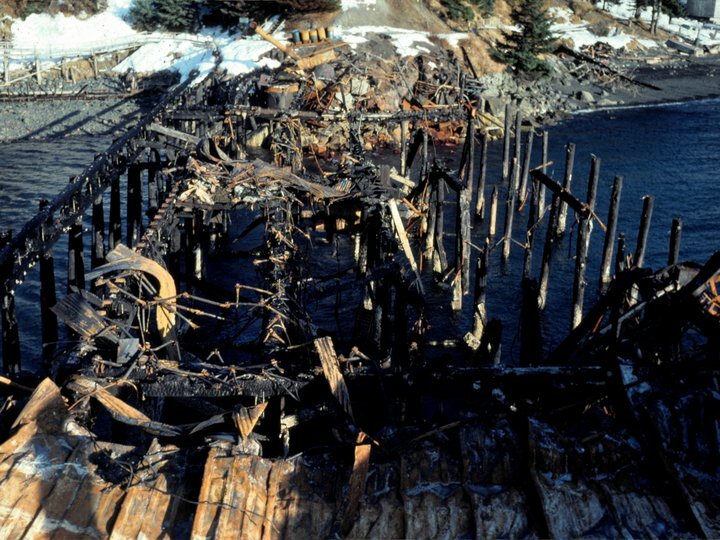 Even photos of the charred remnants of the dock right after the fire – looking for all the world like the skeleton of a giant whale – breaks my heart. But in a way, that violent and final ending to our cannery is in keeping with the lessons I learned there. We had no buffers in Ouzinkie. We and everyone else lived and died, truly, with nature. When I interviewed Tim Southworth for this project, he said his time working in Ouzinkie taught him where “the edge” was. While he learned he wasn’t constitutionally equipped to live on the edge forever, he said it informed his life to know where it was. I think that’s been true for all of us. Like many others in Ouzinkie at that time, I was fortunate to live — and survive — a few years very close to the edge. It was heady, exhilarating, terrifying and unforgettable. At 22, I made a conscious, deliberate choice to step back from that edge. It was the right decision and I don’t regret it. But part of me still longs for the way I felt there, the others I knew there. And to be honest, part of me still misses the view. Diamond NN cannery at South Naknek, Bristol Bay. Canneries were (and still are) cultural hubs that reflect and, in part, spawned Alaska’s diverse population. The Alaska Packers Association (APA) employed mostly immigrants from Europe to catch salmon. Skilled immigrants also built both the canneries and the boats. To process the salmon, canneries hired Asian crews that linked Alaska to the broader Pacific World. Many Alaska Natives who worked at the cannery were descendants of Katmai. Many migrated downriver to South Naknek after the Novarupta volcano destroyed their Savonoski village in 1912 and the Spanish Flu pandemic devastated inhabitants in 1919. APA’s <NN> Cannery in South Naknek is historically significant because the structures, objects and the industrial landscape collectively tell the story of these varied, yet forgotten people. Rusted corrugated tin, discarded machines parts, broken boardwalks, and skeletal remains of bunkhouses are the enduring reminders of the past that gives voice to the cannery workers people who are practically invisible to the historical record. These were diverse people from different places who found dignity through their laborious interactions and forged a deep connection to the surrounding environment. Their work mattered. 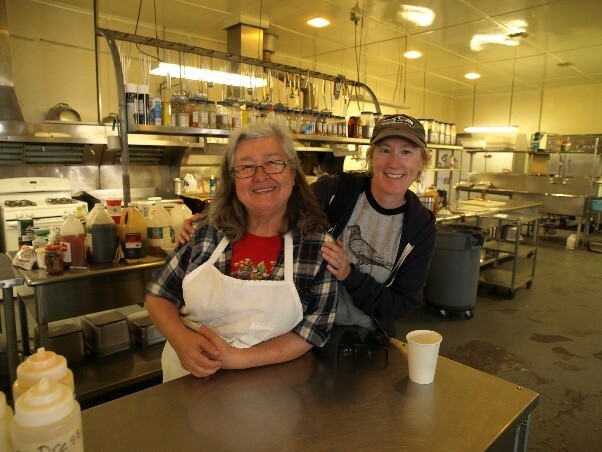 Jeanie Steward and Katie Ringsmuth in South Naknek’s mess hall. According to environmental historian Richard White, “We have obscured and are only slowly recovering [the historical framework] that labor … involves human beings with the world so thoroughly that they can never be disentangled.” Therefore, instead of controlling or conquering South Naknek’s natural landscape, these workers were utterly immersed within it. With the exception of two years during WWII, the South Naknek <NN> Cannery has operated for over 100 years. 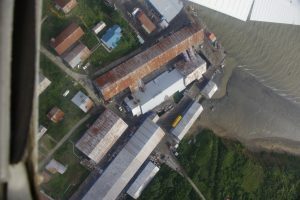 The cannery’s presence on the Naknek River spans a history from the days of salteries to sail boats, tall ships to aviation, steam power to globalization. Collectively, the cannery buildings, boardwalks, machines, and other contributing properties convey a broad range of historical contexts: corporate, technological, cultural, economic, and environmental. Of all the canneries built in Alaska, very few currently left standing possess the <NN> cannery’s integrity of location, design, setting, materials, workmanship, feeling and association, and meet all the criteria for historic evaluation. Bob King presents at Naknek during Fishtival. 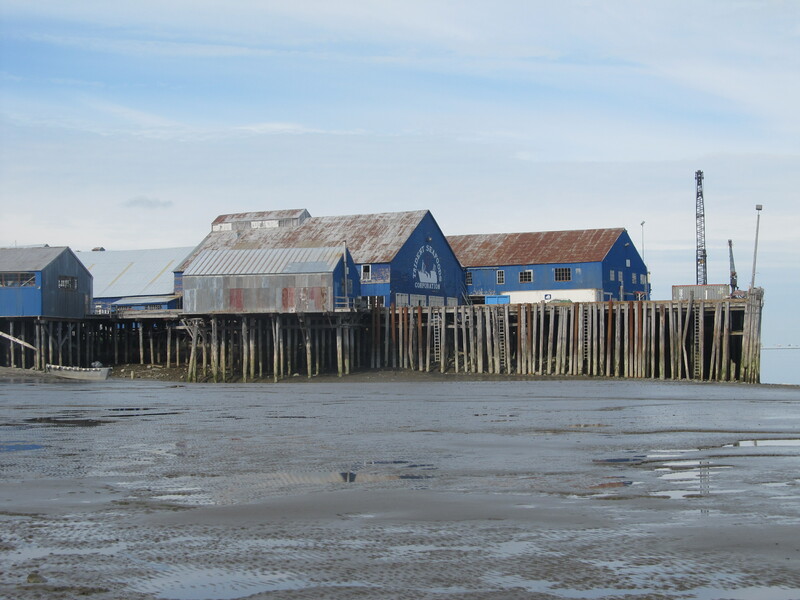 This summer, historians Katie Ringsmuth and Bob King received a grant from the Alaska Historic Canneries Initiative to conduct an initial preservation assessment of the Diamond NN cannery in Bristol Bay. 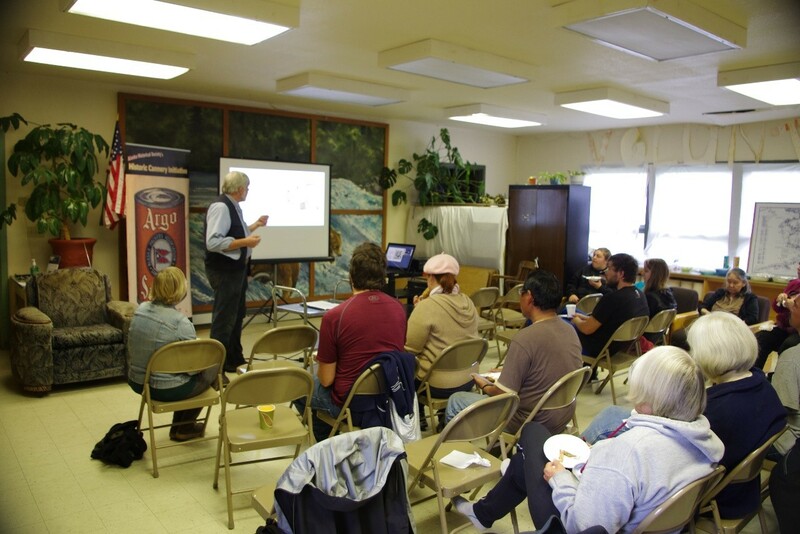 With grant funds, they traveled to South Naknek with John Wachtel, Historical Architect with the National Park Service, built a base of support on both sides of the Naknek River, and created materials to promote the next phase of the project called Canned. Canned is a participatory history project that aims to document, preserve, and interpret the historical and architectural significance of an Alaskan salmon cannery and, perhaps most importantly, to convey to the public the unknown stories of the multitudes of people who canned salmon and created an ethnically diverse, economically vital, cannery culture. In addition to the building assessment, local filmmakers and project collaborators, LaRece Egli and Sharon Thompson produced was a 7 minute film, documenting the historical work. 1968 cannery plat used for the survey. How the interconnected parts worked to create a unified system. Although the project remains a work in progress, the color coded chart produced by the National Park Service shows the structures and their corresponding Architectural and Historic Value, as well as the combined “Overall Value”. The results allow the data to be visualized on a map and, perhaps more importantly, the map gives us a framework from which to start the evaluation process. On November 19, 2016, Bob King, Katie Ringsmuth, Sharon Thompson and Anjuli Grantham, met with executives at Trident Seafoods to discuss the future of the NN Cannery at South Naknek. After a positive meeting, we received the green light to move forward on the NN cannery history project that will take our effort into 2017, and beyond. Trident assured us that they will follow-up with official permission by mid-January. 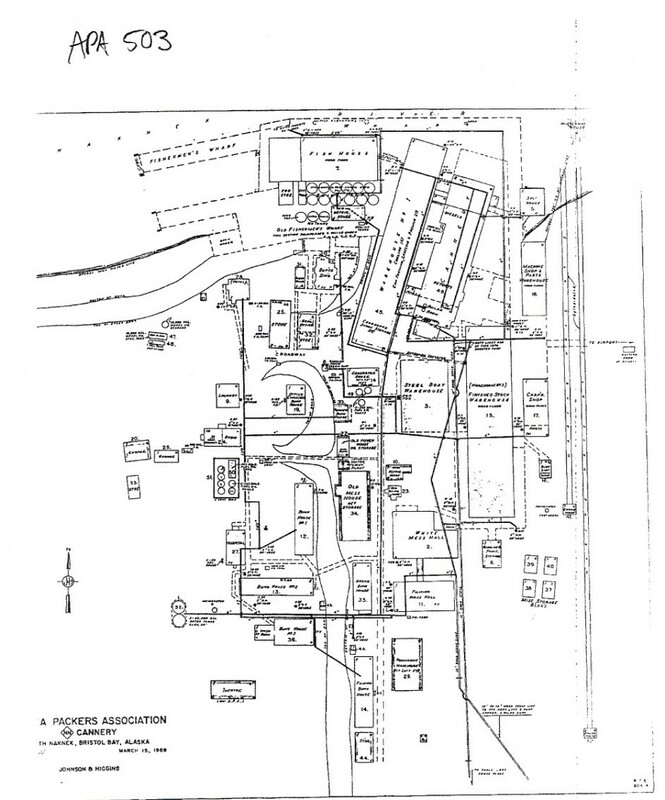 Listing of the South Naknek Diamond NN cannery on the National Register of Historic Places. An illustrative publication about the history of the cannery. A traveling exhibition or series of exhibits that interpret cannery history through the lens of global connections. Stay tuned as the NN Cannery project progresses. Aerial view of Diamond NN in South Naknek.